The packages listed above are for private and personal parties only, do contact us for a quote on public event! None of the above packages suit you? We can customise a package that is suitable for your party. The Variety Party Package is suitable for parties in a group of 20 – 25 kids. How many kids can we cover in an hour? The Games Party Package is suitable for parties in a group of 20 – 25 kids. 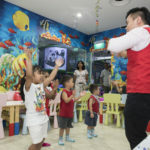 The Magical Birthday Party Package is suitable for parties in a group of 20 – 25 kids. The Magical Variety Party Package is suitable for parties in a group of 20 – 25 kids. The Magical Games Package is suitable for parties in a group of 20 – 25 kids. If you want to make your little ones birthday party a special one, do contact us now.